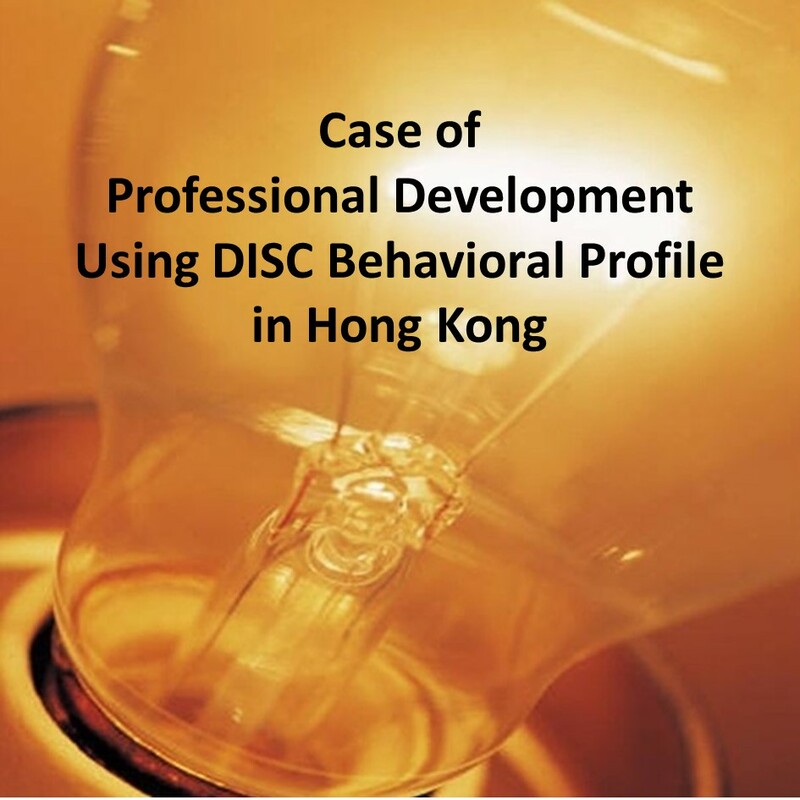 Case of Professional Development Using DISC Behavioral Profile in Hong Kong [Social Workers, Helping Professions, Architectural Firm] | LRT Consulting - Learning Resources & Technologies Ltd. The HRD Press DISC Styles assessment has been crafted specifically to assist organizations in understanding how behaviors impact the success of their employees—and how it all links to the bottom line. 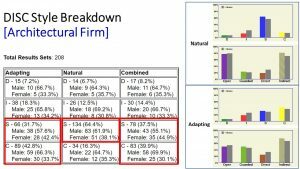 Based on theories originally developed by Dr. William Marston in the late 1920’s, and adapted for effortless facilitation and corporate buy-in, our DISC Styles assessment is a highly validated tool trusted by several Fortune 500 companies, the United States Military, and professional consultants worldwide. This easily administered 30-item assessment includes use of three interpersonal settings to maximize contextual authenticity (work, home, social). 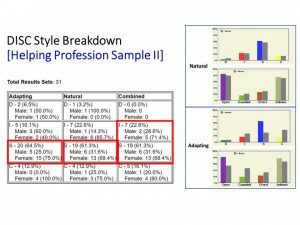 Each of the three standard interpretive graphs are plotted enabling a complete view of your preferred style, and since the DISC Styles assessment can be completed in only 10¬–15 minutes you gain valuable time for individual coaching sessions or group discussions. DISC is a method for describing how people behave. 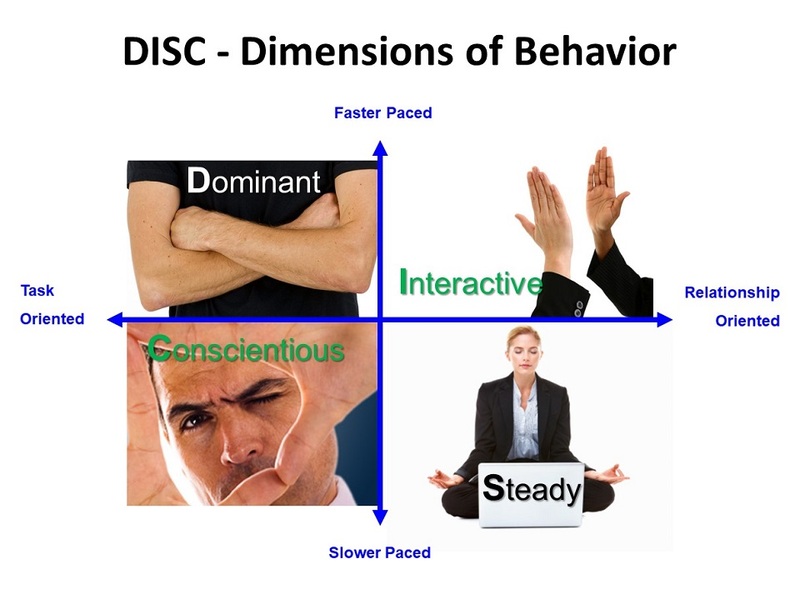 DISC is founded on the idea that all people exhibit the same four styles of behavior in varying degrees. 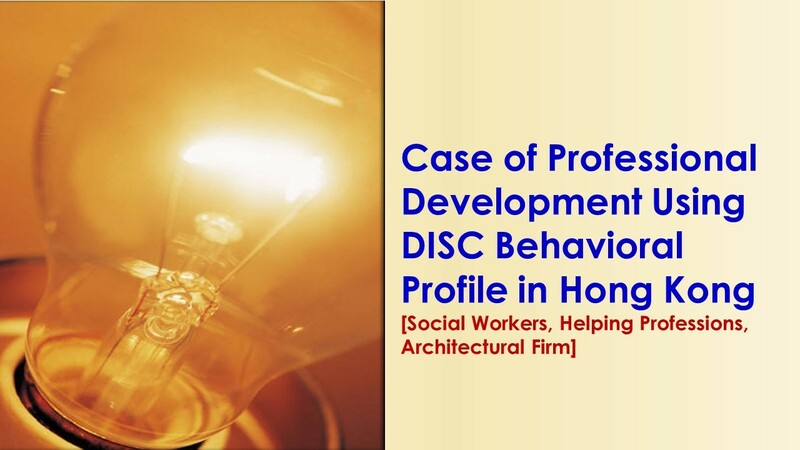 When we use DISC to describe a person, we produce something called a profile. A profile includes information which tells us how strongly a person exhibits each of the four typical styles. By looking at this information, we get a picture of that person’s overall behavior. Many of us grew up believing the wisdom of treating others the way you would like to be treated – the Golden Rule. We soon realized that another practical rule to live by seemed to be what Dr. Tony Alessandra calls The Platinum Rule – Treat others the way they want to be treated. Have your interactions with others succeeded with one person, only to “bomb out” with another the next moment? We all have at one time or another and probably try to shrug it off thinking “That’s just the way it is.” However, things do not have to be that way. Nearly every contact with every person in all areas of your life can be a success – if you know how to make it happen. With this personalized and comprehensive DISC report, you have the tools to help you become a better you and help you behave more maturely and productively by focusing on your goals instead of your fears. Then you can develop and use more of your natural strengths, while recognizing, improving upon and modifying your limitations. This report does not deal with values or judgments. Instead, it concentrates on your natural tendencies that influence your behavior. Historical as well as contemporary research reveals more than a dozen various models of our behavioral differences, but many share one common thread: the grouping of behavior into four basic categories. Our DISC Online System focuses on patterns of external, observable behaviors using scales of pace and priority that each style exhibits. Because we can see and hear these external behaviors, it becomes much easier to “read” people. This model is simple, practical, easy to remember and use. See below for a summary of each of the styles. Emphasizes: Shaping the environment by overcoming opposition and challenges. Tendencies: Getting immediate results, taking actions, accepting challenges, making quick decisions. Motivated by: Challenge, power and authority, direct answers, opportunities for individual accomplishments, freedom from direct control, new and varied activities. Emphasizes: Shaping the environment by persuading. Tendencies: Involvement with people, making a favorable impression, enthusiasm, entertaining, group participation. Motivated by: Social recognition, group activities, relationships, freedom of expression, freedom from control and details. Emphasizes: Achieving stability, accomplishing task by cooperating with other. Tendencies: Calm, patient, loyal, good listeners. Motivated by: Infrequent change, stability, sincere appreciation, cooperation, using traditional methods. Emphasizes: Working within circumstances to ensure quality and accuracy. Tendencies: Attention to standards and details, analytical thinking, accuracy, diplomacy, and indirect approaches to conflict. Motivated by: Clearly defined performance expectations, quality and accuracy being valued, atmosphere is reserved and business-like and articulated standards. Adapting Profile. It is your perception of the behavioral tendencies you think you should use in your selected focus (work, social or family). This graph may change in different environments. Natural Profile. It is your perception of the real you. These are also behaviors you are most likely to exhibit when in stressful situations. This graph tends to be fairly consistent even in different environments. Combination Profile. It is the combination of both profiles. If Adapting Profile and Natural Profile are similar, it means that you tend to use your same natural behaviors in that environment. 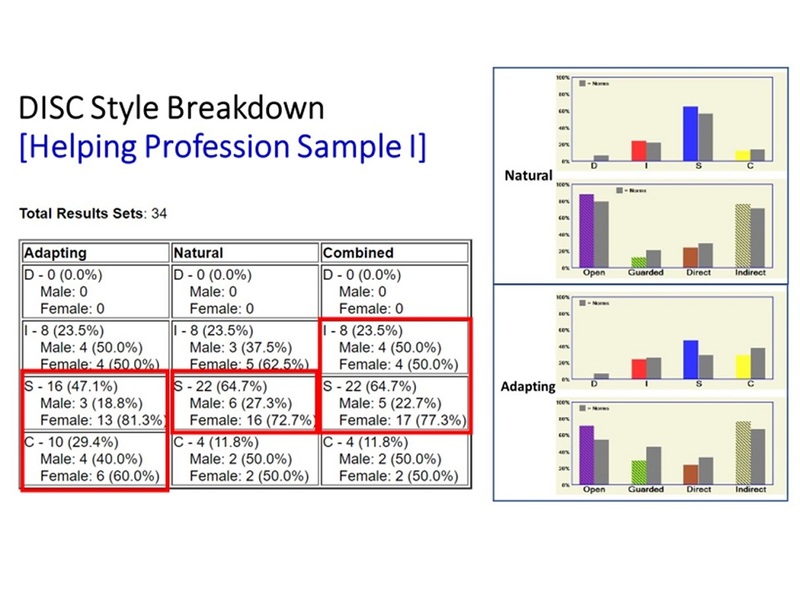 If your Adapting Profile is different from your Natural Profile, this may cause stress if done over a long period of time. You are then using behaviors that are not as comfortable or natural for you. Enquiry about DISC and Other Talent Development Assessments: (852) 2890 9887 or email. Remarks: LRT Consulting is Licensed Consultant with the right to use the HRD Press DISC Styles. Content of the article is adapted from the DISC Profile Report.